On Twitter recently, I was asked for advice about setting up a new one-person UX shop in a library. I’ve only recently emerged from the UX-shop-of-one world, thanks to the addition of a part-time UX designer to my “team” and am not entirely sure how much my experience yields universal insights. So consider the following caveats about how institutional differences will affect the usefulness of any thoughts I have about how to get started. How directly can you make changes to the website (and its attendant ecosystem services and resources, such as the link resolver, the discovery layer, subscription databases, catalog records, proxy server, ejournals knowledgebase, etc.) or to physical locations in the library where you want to work your magic? What is the culture of change in your library? Do proposed changes and new initiatives tend to get debated to death? Does everyone have to weigh in on decisions? With those considerations, here are some suggestions for someone just getting started as the sole person with UX responsibilities (or a UX job title). Useful, Usable, Desirable. A great book about UX in libraries by Aaron Schmidt and Amanda Etches to get started with. Especially useful is the way the book is organized to help you assess all aspects of your library to help you identify where you might want to begin your design work. Rocket Surgery Made Easy. UX expert Steve Krug’s book about usability testing and design work. Don’t Make Me Think. A revised edition of a classic book by Steve Krug about UX and web design. Weave: Journal of Library User Experience. Open access FTW!!! LibUX. Check out the archives of this podcast and make sure you subscribe to it. Carefully gather evidence from user research and save it in a mindful fashion as you work on projects. It is essential to draw on this evidence when making formal proposals for some change you’d like to make. The more you can show your colleagues that design decisions can be driven by evidence and not whim, the more likely they’ll listen to you. Do usability tests on existing systems and services to identify and properly document problems. Learn as much as you can about project management, as a lot of UX design work is a multi-step process that usually involves your collaboration with colleagues who may not always see the big picture of the project. 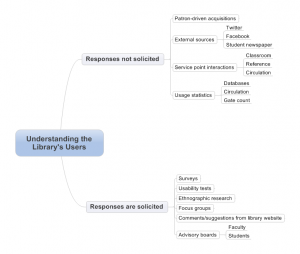 I’m sure there is more to add here (for example, take a look at this nice guide about library UX from Carli Spina at Harvard University for more ideas). If I’ve forgotten something important, or gotten something wrong, please share your comments! Last fall, I was given the OK to hire a part-time user experience designer, which meant that my library’s user experience team was no longer a one-person operation. For the past four years, I’ve been working mostly on my own, although I frequently did projects that paired me up with others in the library (such as the time I worked with the head of access services to set up our new online reservation system for group study rooms). One of the issues I’ve been working through over the past four months since I gained a part-time colleague is communication. Since it is no longer just me here, I need to be more intentional in sharing information. Although there are services to help you with project management in a team setting–things like Asana and Trello–I’ve found so far that a more low-key technology seems to be pretty good far: an internal wiki. I’ve been using our campus’ wiki system from Confluence for many years now and feel pretty comfortable creating a new space there for the UX work my colleague and I are engaged in. In case it is useful to anyone else, I’ll share the set up. The Problem. A quick statement of what problem we are trying to solve with our UX design approach. For example, on the project page for “Databases by Subject,” the problem is that the current page requires too much scrolling. Which is better for users: an alphabetical list of subjects or chunking the subjects within broad categories? If we do use categories, should we still have an A-Z drop down menu on the page that simply lists databases by name? Design Ideas. At all stages of the project, we’re finding we have lots of ideas, both big and small, that may help us when we get to the mockup stage. This is a place to quickly note those. For some projects where it’s likely there is more than one distinct direction to go in, we’ll have a subsection of “General Design Principles” that apply to different options and a subsection for each specific option. For example, we are working on a redesign of the central search box on our home page. We’ve got a general principles subsection to specify things we should include and we’ve got subsections for the two main design options we have: a box with a drop down menu or a box with tabs on top. Milestones. This is a list of the main tasks we’ll need to accomplish. In Confluence, these can be styled as a proper to-do list, which I like because of the satisfaction I get from ticking off a check box once some milestone has been reach. I probably need to read up more on project management techniques to see if it makes sense to break this section out from the Project Timeline section that we also create. Project Timeline. This helps me get a rough sense of the flow of the project and think about how the deadlines align with the academic calendar, which is important as some changes we’d like to make are so major they really shouldn’t go live until the end the semester. Project Documents and Files. We’ve been using a shared Google Drive for mockups, usability test recordings, screenshots of other websites, etc. It’s easier to use Google Drive for this than to go to the trouble of uploading it all to the Confluence wiki. Sources of Evidence Used. This lists the evidence of user behavior that we will use throughout the design process. For a project we’re doing now to redesign the central search box on the library’s home page, the list includes Google Analytics event tracking data on use of the tabs on the existing search box; usability tests; and query log analysis. The items on the list may link to a new page just about that item if it is a big enough thing. That’s the case with usability tests, which are usually big enough endeavors to merit their own pages in the wiki; so, for example, we have a page just about the details of the initial usability test run last December on the central search box. I’m hoping all of this project management work will help me when the time comes to make the case to various stakeholders in the library about the design change I’d like to make. Depending on the scope of the change being suggested, I may need to write a report detailing the research that went into the recommended design. This system of using a wiki for project management has really helped us organize the work better. I suspect, though, that the “to do” aspects of it need some more work. I’d rather not use a separate system to manage that and hope to figure out more ways to use Confluence (for example, I haven’t taken advantage yet of the ability to tag people in Confluence with an @ symbol to assign them tasks). For now, though, I feel like we’re in a better place with this kind of shared documentation. This year, I’ve been doing a lot of thinking about search boxes on library home pages. I’m gearing up to present a plan for redoing the one at my library in the next year and have spent a lot of time looking at how other libraries have solved this design problem (I’ve also been looking closely at search on lots of commercial websites, such as Amazon, eBay, Wal-Mart, etc.). One thing I would love to test with users is whether you can get away with “____ and more” as a search scope label. Many library sites let you focus your search to the catalog, the e-journal lookup system, a discovery layer, the library site search, etc., and label them with some name that identifies the kind of search tool it is: Library Catalog, Site Search, A-Z Journals, etc. Other libraries go the route of deprecating the name of the tool and instead focus on labels that identify the format of information to be found with that search scope: books, media, articles, journals, etc. I’d be willing to wager that if you were to ask your users what they think might be included in the “more” category, you’d be let down by their wild, very off-base guesses. This is of course a testable claim I’m making. I don’t know if anyone’s written up anything about this very question of “what does and more mean to you” but would love to read it if it’s out there. Until I find such evidence or do my own testing, consider me skeptical about the value of “____ and more” as a link label or explanatory text. Although my job title is user experience librarian, I help out quite a bit with managing electronic resources in my library. Over the past few years, I’ve gone down deep in the weeds countless times trying to figure out what went wrong when a user reported being unable to access an electronic resource. Some times it’s just one article, some times it’s an entire database. The possible points of failure (or confusion) for the user are many. Here’s an exhaustive list (for me, at least) of what commonly goes wrong for our users. library has cancelled subscription but forgot to remove all links to it on their website, catalog, discovery layers, knowledgebases, etc. I really like the sound of that word, as it seems more collaborative and non-egotistical than saying you are “showing leadership” in a meeting. It may be a subtle distinction that only works for me, but that’s fine. At my library, I’m the only person with UX as part of my job title and core job focus (which isn’t to say that my colleagues don’t do UX work, as they do but may not think of it as such). In meetings for various projects–some local to my college’s library and some for projects that are shared across the system of CUNY libraries–I find myself wanting to contribute in ways that draw on my UX perspective. The last thing I want to do when I speak up is make it sound as though I am the expert that all must bow down to. I think if in my mind I frame my efforts as being “leaderly” I’m more comfortable with speaking up or contributing in other ways. As an exercise in making a list of the main ways that I can learn about our users in the college library where I work, I put together this little mindmap that delineates between those sources where we are actively soliciting responses from our users and those sources where were are sifting through the traces of the users’ interactions with our services and systems. Did I miss anything important?